Child abuse is America’s worst, best kept, secret. It’s an epidemic, and the only way to curtail it is to Speak Up, educate communities on preventing child abuse and neglect, and give neighborhoods the resources to seek help when they are struggling. Truth: Child abuse and neglect occur in all types of families, no matter the income, education, family size, race, religion, or any other trait. When you visit a Childhelp Children’s Center, for every child brought in wearing ragged clothing, you see a child dressed in expensive outfits who could be out of a magazine or commercial. Abuse knows no economic boundary. Truth: Child abuse has far-reaching impacts, and family dysfunctions like a mother treated violently, substance abuse in the house, a family member with mental illness, or parental separation/divorce can all have similar long-term health impacts to abuse and neglect. Many of the calls to the Childhelp National Child Abuse Hotline come from concerned friends and families of abuse victims who are in crisis. They turn to us to seek ways to stop the violence and find shelter. Myth: Strangers are more likely to abuse/neglect my child. Truth: Over 90 percent of sexual offenders are someone the child knows and trusts. This is why places like the Childhelp Community Center are so important. When we have prevention partners in at-risk regions, we increase the amount of eyes on a child. If a parent or family member is offending, that little child needs all the advocacy possible. Myth: The long-term effects of abuse or neglect are minimal. Truth: Children who experience abuse or neglect are nine times more likely to be involved in criminal activity later in life. Furthermore, child abuse has been seen to physically alter DNA, affecting descendants. It is also very costly with lifetime costs of $124B and rising. This is why a Childhelp Residential Treatment Village is so important. We work night and day to counsel, educate and rehabilitate children so that they can go on to live healthy and productive lives. 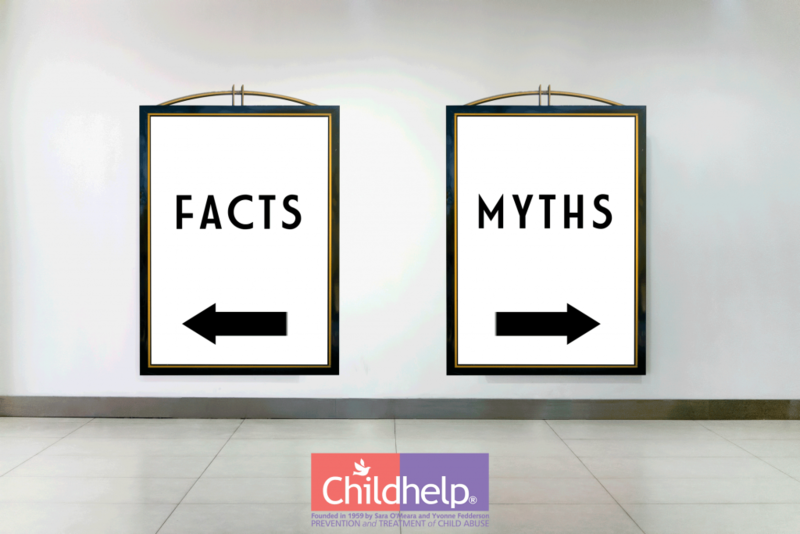 Myth: People report every case of child abuse. Truth: CPS reports underestimate the true occurrence of child abuse and neglect. Working with our partners in law enforcement, legal and legislation, we make it easier to report abuse, more effective to prosecute it and less traumatic for the child in the process. Truth: Child abuse can be physical, sexual, emotional, or neglect. In fact, 25% of cases are emotional neglect or abuse which usually leave no hard evidence. We work with medical experts and forensic interviewers to ensure that the bruises you see and those you don’t are all recorded to ensure a child’s complete story is told. Truth: Not even close. Only one in ten children tell anyone. This is why Childhelp Speak Up Be Safe is so important as it educates children that it is okay to tell safe adults about child predators. Myth: I can’t do anything to prevent abuse in my communities. Truth: You can do a world of difference by speaking up if you suspect abuse or neglect. You can call the Childhelp Child Abuse Hotline (1.800.4.A.CHILD) or call 911 if you believe a life is at risk. Fear, lack of knowledge and apathy can take a life but strength, education and taking action for the love of a child can free a hurting heart forever. And that’s no myth! If you ever have a question about abuse or wish to learn more, please visit Childhelp.org or call the Childhelp National Child Abuse Hotline (1-800-4-A-CHILD) to speak with one of our certified crisis counselors. Giving Thanks. Giving Hope. Giving Back.